What exactly is a Budgerigar? What is the difference between a Parakeet and a Budgie? Budgerigars are improperly called "Parakeets", or "American Parakeets". The term parakeet is a general term for a large group of small, long-tailed parrots and it is not the true name for this species. Budgerigars, or Budgies for short, are probably the most commonly owned companion parrot. 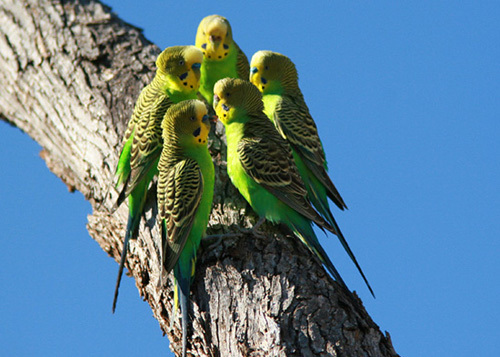 The source of the name Budgerigar has been speculated to come from a combination of words from Australian English slang. "Budgery", slang for "good" and "gar", slang for "Cockatoo". (encyclopedia.com) I have also heard that budgerigar means "good to eat". Parakeets and Cockatoos are both from Australia, are they related? What does a typical Budgie or pet parakeet look like? How do you tell if a budgie is male or female? The cere typically indicates sexual dimorphism in Budgerigars. Both genders of budgies under a year old generally have light pink ceres. The cere on a Budgie usually changes within the first year of the budgie's life. Typically, the cere in a male Budgie is blue and the cere of a female Budgie is crusty and brown. Recessive pied, albino, lutino and dark eyed clear Budgies will not experience a change in their cere colors because of their genetic mutations. Some Budgerigars also experience color changes in their ceres during their breeding seasons. (answers.com) A cere color change during breeding season is likely due to changes in hormone levels. Where do Budgierigars originally come from? Wild flocks of Budgies live in the central, hot and dry areas of shrubland, woodland and grassland habitats of Australia. Their flocks form enormous swarms or clouds of birds, and they are nomadic birds which follow food and water sources in Australia. The wild flocks eat mostly grass seeds in Australia. (answers.com) Budgerigars adapt to the desert like climate of Australia because of their ability to conserve water and their resulting droppings are very dry. Is a Budgie a suitable choice if you are a beginner with parrots? Budgerigars are underestimated because they are parakeets. They are small, inexpensive, and widely available. With patience and proper training techniques, they are just as capable of learning many tricks, they can be just as entertaining, they are enjoyable pets and they are a great alternative to a bite from a larger bird's beak. Where can I buy a Budgie? Budgies are readily available birds sold in most pet stores, especially in chain pet stores. Budgies can also be obtained from a budgie breeder or an animal shelter (or rescue). I want a Parakeet from a pet store, which one should I choose? How long is the average life expectancy of a Budgie? With proper care, Budgerigars live for about 15 to 20 years. However, their average life expectancy is only about 5 to 8 years long. (answers.com) Unfortunately, these birds are often subjected to improper treatment and care. Many companion or pet budgies are poorly raised and fed unsuitable diets, resulting in premature deaths because of fatty tumors. Is a Parakeet a good pet for a child? Pets are not good for any child without the supervision of an adult. An adult needs to be sure that any pet is fed, groomed and taken care of properly. A pet is a fun and exciting method to teach a child responsibility, but since a child can barely care for itself, a a pet should not be neglected. Any pet's life should not be put in danger by irresponsibility, immaturity and boredom. What basic pet supplies should I get for a Budgie? The basic supplies needed for a pet Budgie are a suitable cage, natural wood perches, a few suitable sized and safe toys, a cuttlebone, food and water dishes (or a water bottle), newspapers to line the bottom of the cage, a travel carrier, kwikstop, and a cage cover (thin blanket or sheet). What size cage should I get for a Budgerigar? As for all parrots, the larger the cage size the better. Budgies should not have a cage with bar spacing greater than 1/2 of an inch and any cage with large bar spacing would be a safety hazard. Budgies typically fly or jump between their perches, so a cage that is wider would be more suitable to allow for very short flights. A wider cage is important in allowing a Budgie to sufficiently exercise, and a cage with guillotine doors is not recommended for safety reasons. If a guillotine cage must be used (because most suitable sized cages for Budgerigars have these doors), it is highly recommended to put clasping locks/key chain locks on the doors for secure but easy opening and closing. What should I feed my pet parakeet? A diet suitable for a Budgerigar is a diet higher in seeds than some other parrots, but a diet of only seeds is extremely unsuitable. A Budgie's diet should consist of as much variety as possibe. What is recommended is a noncolored pellet, vegetables, fruits, grains and seeds. Some toxins that should be avoided for all companion parrots are chocolate, alcohol, avocado, caffeine, lactose (milk products), onions, garlic, and foods high in salt, fat, or sugar. A cuttlebone or mineral block can be a good source of calcium as well for a Budgie. How loud do parakeets get? One lone budgie will not be an extremely noisy pet. Budgies do occasionally chirp, and on a rare occasion, make a sort of screeching sound. It must be understood that all parrots make noise. However, these parrots are extremely suitable for apartments or condos because they are generally quiet. 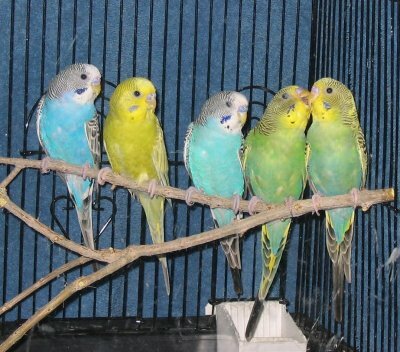 Multiple Budgies (3 or more) may increase the volume by a large amount because the Budgies will communicate with each other with constant chirps and occasional screeches. Do Budgerigars talk or mimic sounds? Why doesn't my Budgie play with toys? Some Budgies do not seem to enjoy playing with toys that they are provided with. Some of them don't know what toys are for. Toys should be appropriately sized for a Budgie's beak, nontoxic and safe. If your Budgie is not playing with the toys you have put in their cage for them, try showing your Budgie how to play with a toy. If the toy has a bell, show it to them and ring it for them. If the toy is supposed to be shredded, shred it a little for them (to start it off) and show them the shredded part of the toy. See if they become interested. Other Budgies may be scared of their toys. To introduce a new toy, leave the toy out of their cage but in sight for a few days so that the Budgie isn't scared of a new toy. I'm afraid one Parakeet will be lonely, should I get two? Getting a second budgie is a common mistake. Budgies, like all parrots, are highly social animals. If you intend to get a bird, you should commit yourself to spending time with it so that it does not become lonely. If you don't spend time with your Parakeet, it will be lonely. If you intend to have a bond with your budgie, you should only get one Budgie. While multiple captive Budgies can be housed together, they usually bond to each other more than to their owner. Can Budgies be taught tricks? Budgies can be more difficult to train tricks to than a larger parrot because they can be hyperactive and they have a lower attention span. They are small, fast moving, and have a quick metabolism. Their size makes it difficult to teach some typical parrot tricks such as wave because their feet are so small and they are ground feeding birds who do not lift their feet to hold food and eat it. However, this type of Parakeet can learn to do many tricks. This video depicts a Budgie targeting, jumping through a hoop, running through different sized tubes, running through a slinky, spinning around or turning around in a circle, hanging upside down like a bat, and sliding down a slide. Other tricks that Budgies are capable of which are not featured in this video are to fetch or retrieve objects, to wave, to open their wings, to recall fly (fly somewhere or to someone on cue), to give kisses, to climb up a rope and more. How do I teach my Parakeet to step up? To teach your bird to step up on your finger, hold your finger up to your bird's abdomen. If your budgie doesn't step onto it, gently press your finger against its abdomen and your budgie will become unbalanced. In order to correct its balance, it will step forward onto your finger. Before your Parakeet steps up onto your finger, say "step up" or "up", and after it is perched on your finger, tell your budgie it is a good bird, and reward it with some attention and praise. You may have to repeat this again and again, but with some practice, your bird should learn that a finger near its abdomen with the verbal command "step up" is a cue to step onto your finger. How can I get my Parakeet to stop biting? If your Budgie is aggressive or afraid of you, it may try to bite you, jump away from you, run away from you, or fly away from you. Parrots respond to a stress with a fight or flight reaction. This means that your budgie is probably going to fly away from you if it can. If it cannot and feels trapped, it will try to bite you as a last resort or as a last defense. Your parrot would prefer to fly away from you if it is scared of you, but if it is aggressive, if it is afraid for its life, if it is clipped and cannot fly, and if it is trying to defend its territory or its mate, it will probably bite you. Fortunately, Budgerigars don't nip very hard. Their beaks are very small and their bites are equivalent to a pinch. They would probably have to nip you in the same spot many times in order to break the skin. You can't stop your Parakeet or Budgie from biting you. Your bird has to figure out on its own that biting you is a waste of time, that you are nice to it, and it has no reason to bite you. You have to ignore any bites by not reacting to a bite. Don't ever give your bird what it wants as a result of a bite or it will continue to try to bite you to get what it wants. My Budgie just keeps nipping me instead of stepping up, what should I do? This video depicts a Budgie during a target training session. Every time the Budgie touched the very tip of a chopstick, the Budgie heard a click, and received a treat. This video depicts an effective hands off approach to get your bird to go where you want it to go. This technique can be used to get your Budgie to come out of its cage, step onto your finger, fly to you, step onto a stranger's finger, etc. without biting you. How do you hold a Parakeet properly? To hold your Budgie properly, simply wrap your hand around your Budgie's back and leave its chest open and free to move. Essentially, wrap your fingers around the sides of your Parakeet. You may hold its neck in place to prevent it from moving its head around to bite you (but not squeezing). You can do so by wrapping your thumb (gently!) around and pushing up a little on the head to prevent it from moving its head around to nip you. Never hold your Budgie around its chest and never squeeze your Budgie or it may not be able to breathe. It is safer to let go of your Budgie if it is squirming than to grip or squeeze your Budgie too hard. This image demonstrates one way to hold your Parakeet during wing clipping, but it can also be used to cut nails, examine your Parakeet, or simply hold it if you need to. Last edited by TheNzJessie on Wed May 25, 2011 1:01 am, edited 1 time in total. Hey, everyone! I know I'm being a troublemaker and posting in an older thread, but I wanted to come on here to thank Kathleen for all of this generous info! I just so happened to be looking for information on various types of parrots/parakeets and stumbled upon this Budgerigar info. My, oh my -- we've got ourselves a walking dictionary. Really, I'm glad that you managed to accumulate all of this info and throw it together. Y'see, I'm looking to get a parrot (maybe an eclectus parrot)sometime soon and I'm looking into all varieties. I DO have 2 canaries (whom I love so dearly), but I want to add at least one or two more friends to the family. Obviously, they would be in separate cages, but you get the gist. I'll certainly come back to this page (should I choose to get a Budgerigar and I'll be good to go! Thanks, Kathleen! Thanks this really helped! Thanks Kathleen! MAH BIRD CAN STEP UP NAOW THANKS KATHLEEN!!!!!! Kathleen, you're just brainiac! thank you so much! Jorge wrote: Kathleen, you're just brainiac! thank you so much! She's just good like that LoL!